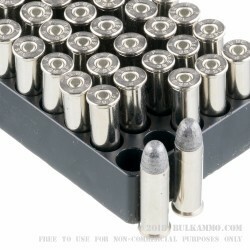 Quantity - 50 rounds per box; 10 boxes per case. As one of the most storied rounds amongst revolver enthusiasts, the .38 special has a long history of tried and true performance. 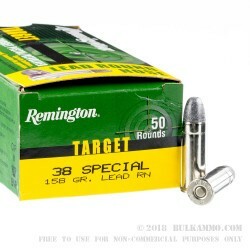 The Remington 158 grain .38 Special Lead Round Nose is ideal for high volume, competition shooters looking for an economical solution to their training needs. The Remington 158 gr. 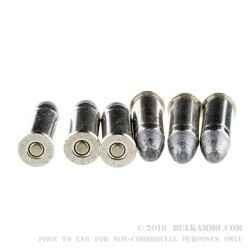 .38 special lead round nose bullets are renowned for their flat shooting trajectories and mild recoil. Toothed cannelures ensure proper bullet seating and consistent chamber pressures regardless of lot or date of manufacture. 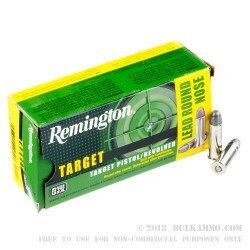 At an average muzzle velocity of 760 feet per second, the Remington 158gr .38 Special LRN has a max effective range out to 25 years and beyond, and is ideal for three gun and NRA competition shooters who need to consistently engage targets at various distances while on the move. Hobbyist and high volume shooters alike in search of an economical ammunition that is not light on performance will find a perfect match shooting the new Remington 158gr .38 special LRN.